One of the biggest contracts in Brotherhood history is yours to fulfill. Travel to Whiterun and talk to Amaund Motierre. Knowing the true Emperor's location, travel to Solitude's docks. Kill Emperor Titus Mede II. Return to Amaund to learn the location of the dead drop. (Optional) Kill Amaund Motierre to fulfill the Emperor's dying wish. Travel to Volunruud to collect your reward. Return to Nazir at the Dawnstar Sanctuary. Despite the devastation wrought on the Dark Brotherhood, the Night Mother wants you to finish your contract and kill the Emperor, Titus Mede II. The real Emperor's whereabouts are unknown, so travel to Whiterun and find Amaund Motierre in his room at The Bannered Mare. 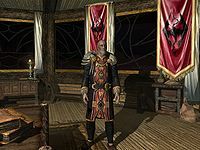 Amaund will reveal that the true Emperor is on board his ship, The Katariah, near Solitude's docks. Amaund will also inform you that Commander Maro is outside the East Empire Company Warehouse at the docks, should you wish to exact revenge. Go to the East Empire Company Warehouse, near Solitude. Commander Maro will be standing on the dock. If you approach him, he will be startled by your appearance and proceed to attack. This will allow you to kill him without incurring a bounty, and the nearby guards may even assist you if you allow Maro to make the first strike. Alternatively, kill Maro from a distance or sneak up to him and kill him stealthily. It's worth noting that Maro has his own faction, so any bounty you incur when attacking him will be lost on his death. You can, if you wish, ignore Maro completely and move on to the next objective. The next target is the true Emperor, aboard his ship The Katariah, moored out to the north of the city in a channel called the Solitude Inlet. Security has been relaxed somewhat, as the Penitus Oculatus believes that the Dark Brotherhood has been completely eradicated. Nonetheless, many bodyguards are still present on the ship. Access the ship underwater by using the anchor to climb aboard. On board the ship are sailors and Penitus Oculatus Agents, both of which are relatively weak and easy to defeat. You can fight your way through the ship or simply sneak through, as few guards will be patrolling the hallways and can all be picked off quite easily, though some will attack with both sword and shock spells. You will not earn a bounty for killing or being seen by anyone on board. You can also traverse the upper deck, which contains many guards. A unique sword, Windshear, can be found at the very end of the bowsprit - the slanted mast at the ship's bow. King, a Two-handed skill book, can be found next to the throne, on the highest part of the ship's deck. Captain Avidius and Lieutenant Salvarus are also present on the ship, both in their individual private quarters, and are somewhat tougher than the other guards. They both carry a Katariah Master Key, which will open all doors on the ship, including the Emperor's Quarters. There is another master key on a hook in the captain's quarters, just to the side of the door. Enter the Emperor's Quarters. Whether you came in sneaking or not, the Emperor will greet you straight away, as he has been expecting you. He will acknowledge that it is his destiny to die by your hand, and will not fight you. He asks, however, for you to listen for a moment before killing him. You can, if you want, kill the Emperor instantly, or hear what he has to say. The Emperor simply asks that you consider killing the person who masterminded his assassination, as he feels that his intentions could be malevolent. After slaying the Emperor and finally completing this arduous contract, take a look around his quarters. There are some rare books lying about and some very expensive gems and jewelry behind a locked door, which can be opened with the key the Emperor holds. The unique Gilded Wristguards and an extra set of the Emperor's Robes are also to be found. There is even a book on the third era, which tells about Empress Katariah, after whom the ship was named. Use the Emperor's key to exit the ship and return to Whiterun to speak to Amaund. He will reveal that the money for the contract is in a dead drop inside the cavern where you first met, in Volunruud. After informing Amaund of the Emperor's death, you may speak to him again to say that you have unfinished business with him, but he does not comprehend what you mean by your cryptic words and will not attack you. You may kill him if you wish to fulfill the Emperor's last wish. If you do, a surprised Amaund's last words will be, "But... we had a deal..." Amaund's corpse can be looted for a vast amount of gems. However, if you do not wish to kill Amaund, the gems may be easily pickpocketed from him. Go to Volunruud and the chamber where you first met Amaund. Inside, you will find a normal chest and an urn containing 20,000 gold. Return to the Dawnstar Sanctuary and speak to Nazir about the gold, and he will ask how much money you received. You can choose to lie to him, but you keep the entire reward regardless of the option you choose. Nazir will point out that Delvin Mallory of the Thieves Guild could assist in using the gold to restore the sanctuary. The weapons found on the ship are level-dependent, with a chance of rare items being found. Depending on how you kill him (such as with certain spells) the Emperor might end up getting stuck outside the wall of the cabin and you will be unable to loot him. Onboard the ship, there is a room containing a sailor with another sailor and a Penitus Oculatus agent dead in their beds. The sailor still alive already has his weapon drawn, implying he murdered them as they slumbered. After entering at the lower deck of the ship, the first staircase you go up leads to the second level of the upper deck. In the room with the Alchemy lab, the Guard and Sailor might spawn dead. Windshear may spawn below the mast, so you have to fall off and grab it in midair or shoot it with an arrow and dive to the ground of the water to obtain it. If you approach Maro for the first time after killing the Emperor, but before turning the quest in, he'll ignore you and neither attack nor talk. Sometimes, jumping on a table against the wall in the Emperor's chambers will cause you to fall through the ship into the water. 5 The Night Mother has spoken to me once again. The true Emperor must be assassinated - the contract with Amaund Motierre must be completed. Objective 20: Kill the Emperor! 200 Finishes quest The Emperor has been assassinated. The Dark Brotherhood will, once more, be feared and respected the world over. The following empty quest stages were omitted from the table: 0, 1, 2, 3, 255. On the PC, it is possible to use the console to advance through the quest by entering setstage DB11 stage, where stage is the number of the stage you wish to complete. It is not possible to un-complete (i.e. go back) quest stages, but it is possible to clear all stages of the quest using resetquest DB11.